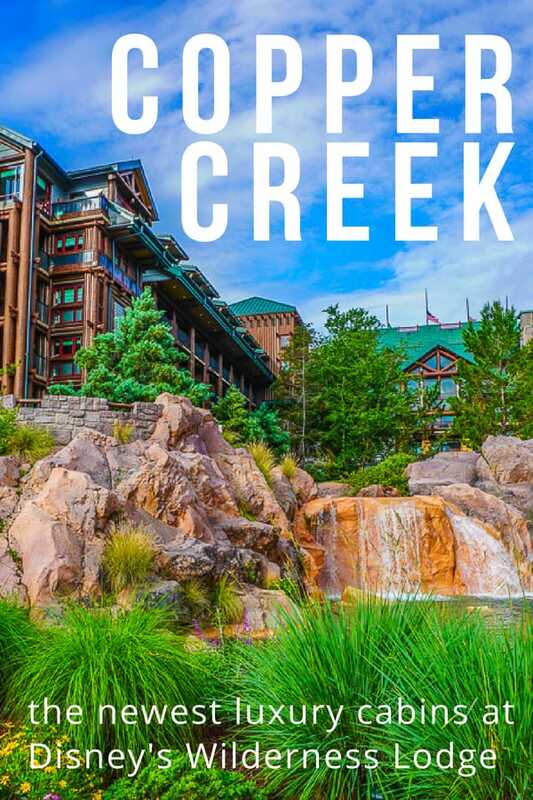 Cabins at Copper Creek Disney Wilderness Lodge: DVC's Finest? 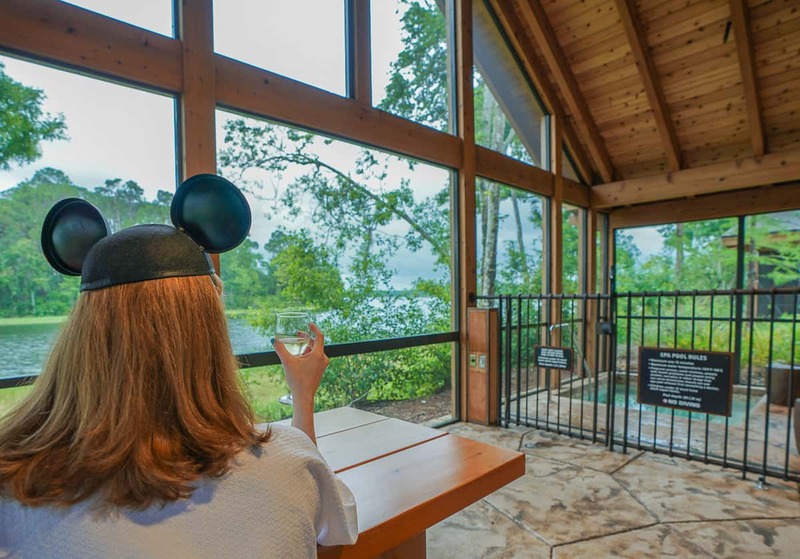 The fenced in hot tub on the porch gives off a blue light at night, and the sounds of the fireworks and Electrical Water Pageant tell you that you have found a new way to experience magic, Copper Creek Disney style. Disney World is constantly evolving while still providing a timeless destination filled with nostalgia. In the last few years, the Walt Disney Company announced several new expansions to its theme parks and resorts. 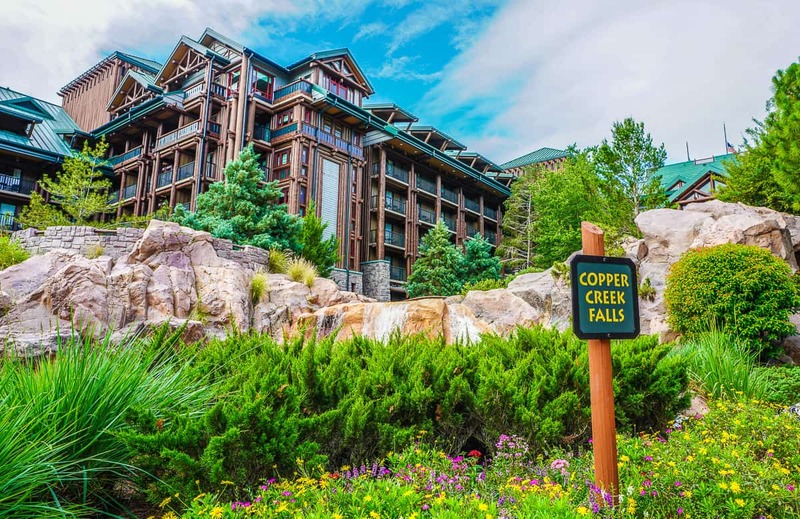 With Copper Creek Disney has kicked it up a notch (or two!). 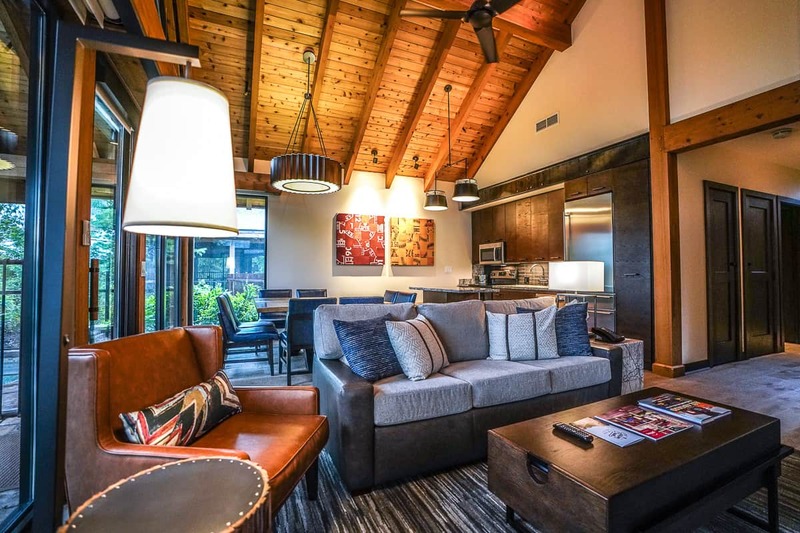 The Cabins at Copper Creek are the newest and some of the most luxurious Disney vacation club properties at the Walt Disney World resort. They are getting all the buzz for good reason. These 26 stand-alone two bedroom cabins have lakefront views from their soaring A-frame ceilings. The lobby’s scale and detail will impress. Walking into the Wilderness Lodge for the first time is an experience. The soaring multi-floor open lobby is similar to that of Jambo House at Animal Kingdom Lodge and the Grand Floridian. The scale dazzles you. While the Grand Floridian feels so festive with its ragtime balcony band, and Animal Kingdom Lodge seduces you with its glimpses of faraway lands in Africa, the Wilderness Lodge welcomes you home to the serenity and comfort of the outdoors, campfires, and the majesty of country’s grandest treasures of the American West. The architect behind the Wilderness Lodge is the late Peter Dominick. 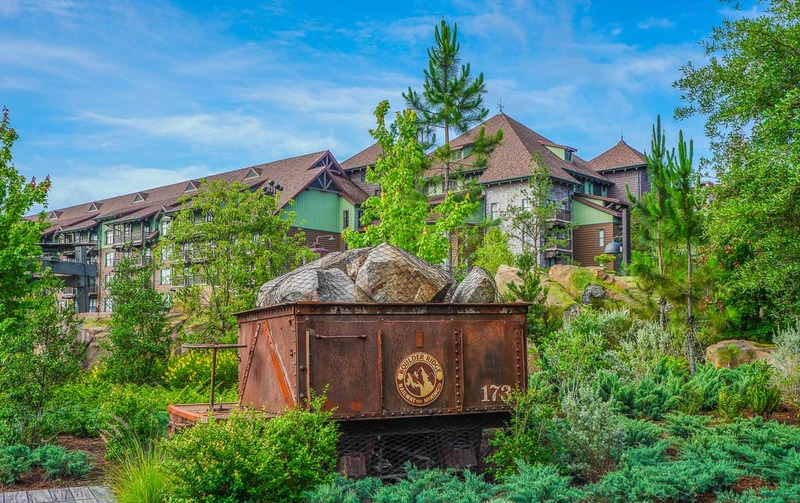 After the Wilderness Lodge, his first project for the Walt Disney company, Mr. Dominick went on to design Animal Kingdom Lodge, the Grand Californian at Disneyland, and Stowe Mountain Lodge (one of our favorites in Vermont). 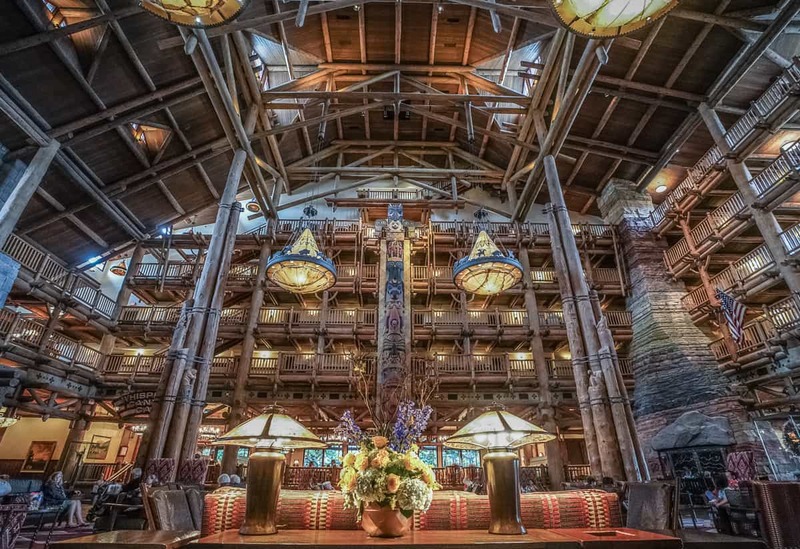 The Wilderness Lodge is modeled after the great national park lodges. 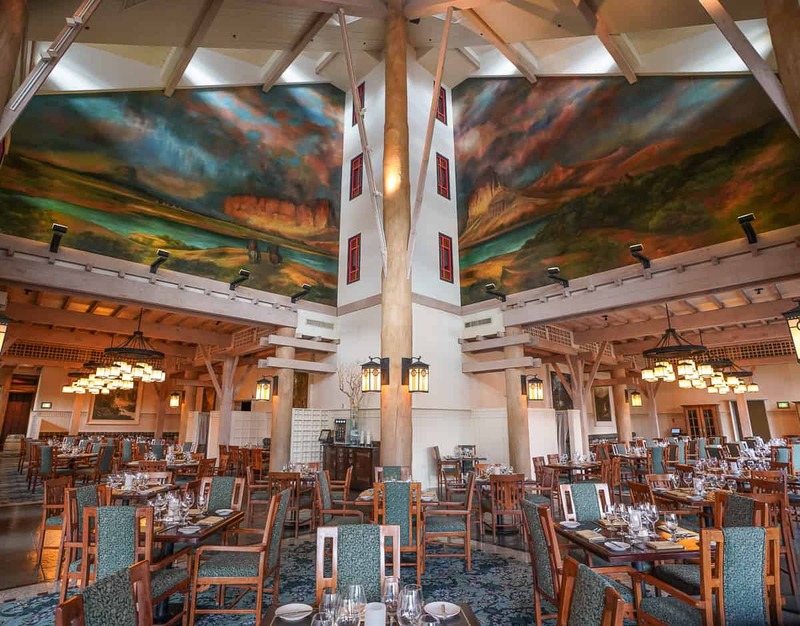 The Old Faithful Inn in Yellowstone National Park, the Ahwahnee Hotel at Yosemite, Lake McDonald Lodge at Glacier National Park, and Timberline Lodge at Mount Hood, Oregon inspired the Disney composite of the ultimate national park lodge. WHERE YOU CAN ASK ALL OF YOUR DISNEY TRIP QUESTIONS AND GET THE ADVICE YOU SEEK. Details in the design draw from indigenous art from the Northwest like the real totem poles and an elaborate headdress on display in the lobby. 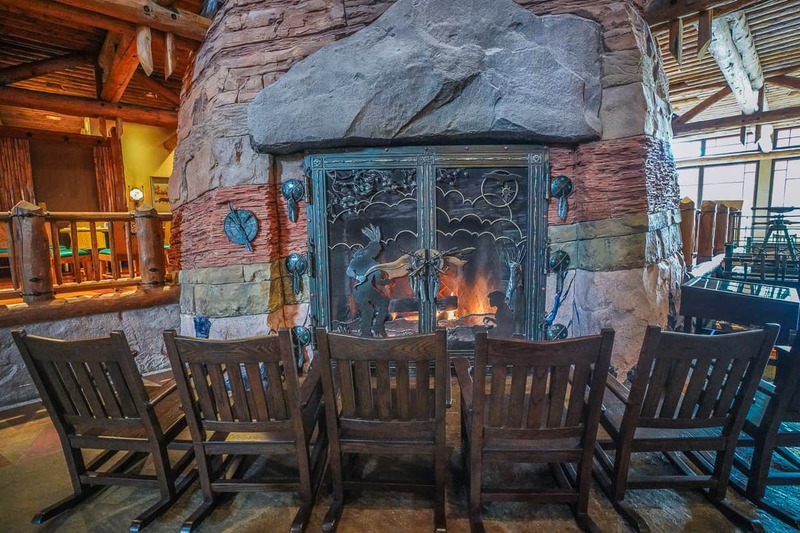 A large stone fireplace in the lobby, reflecting the palette of the Grand Canyon makes this one of everyone’s Walt Disney World resort of choice at the holidays. 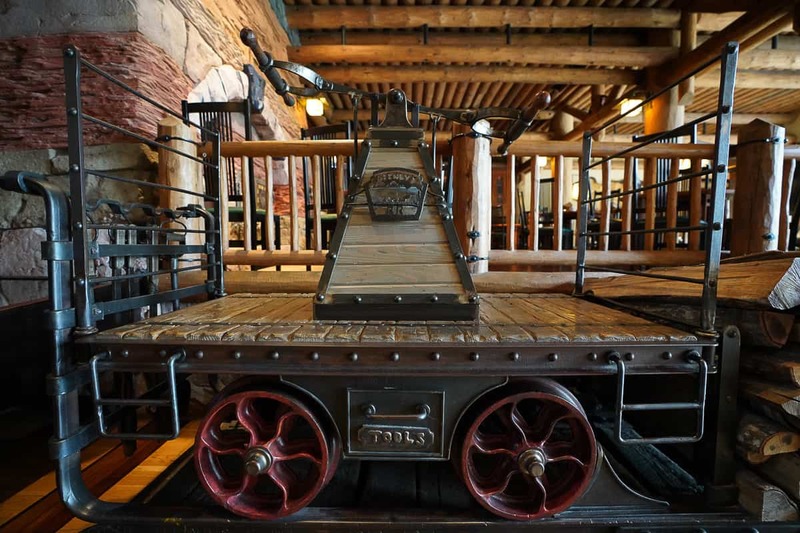 The role that train travel played to enable the settlement of these lands is featured, and Walt Disney himself was enamored with trains and their history. Rusty train and railroad artifacts blend with a hot spring and geyser on property. Where is the Wilderness Lodge? The Wilderness Lodge is a deluxe Magic Kingdom resort, but it is the only one of these four resorts not on the monorail system. 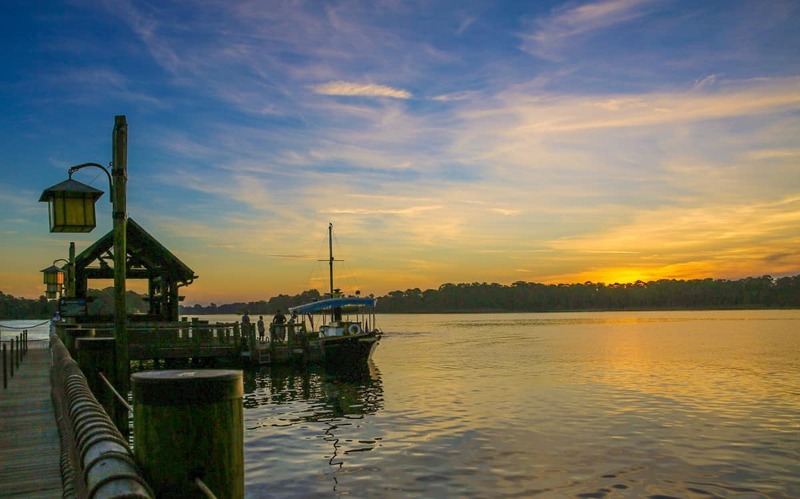 There is a boat that takes guests to Magic Kingdom across Bay Lake, and both the Contemporary Resort and the Fort Wilderness Resort also have this boat service. 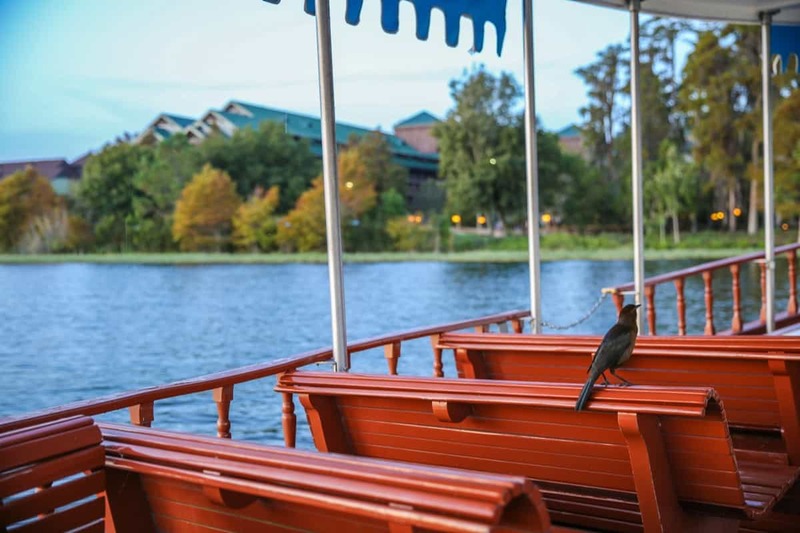 The Wilderness Lodge offers boat service to Magic Kingdom park that proved to be very convenient, as the boats run on a very consistent schedule. One boat route also stopped at the Contemporary resort. Resort guests can catch passes to all of the Disney parks and Disney Springs near the entrance to Boulder Ridge. The bus stop will have electronic locks showing guests when to expect transport based on the dynamic schedule throughout the day. Boat service to the Magic Kingdom starts before the parks open and ends long after the parks close. The Copper Creek Falls pool. Every deluxe Disney resort approaches the recreation similarly. 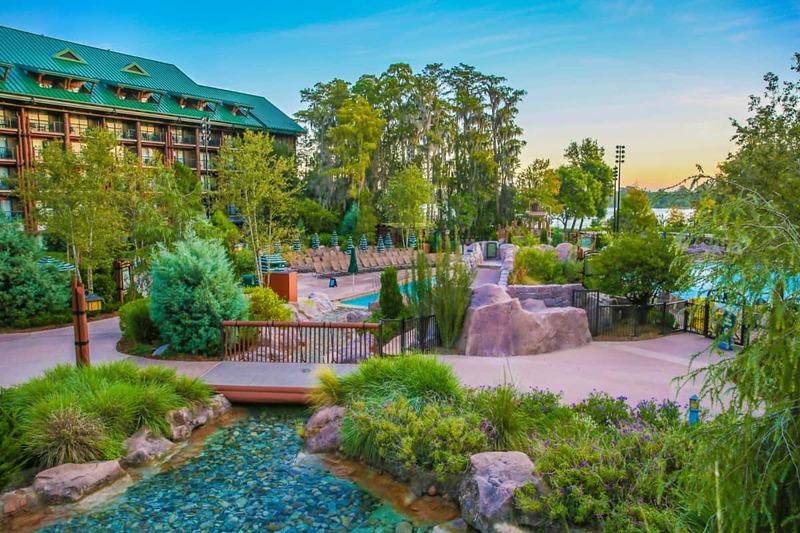 The Wilderness Lodge, like the others, has its own arcade, boat and bicycle rental, and swimming pools. 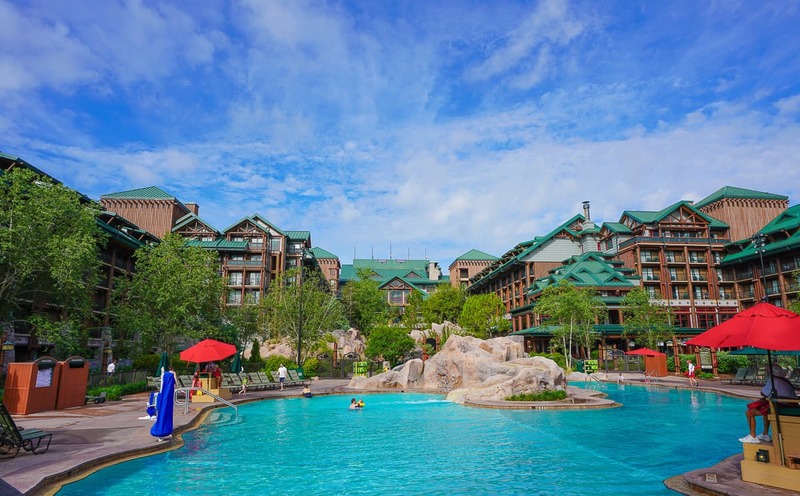 There are two pools at the Wilderness Lodge. 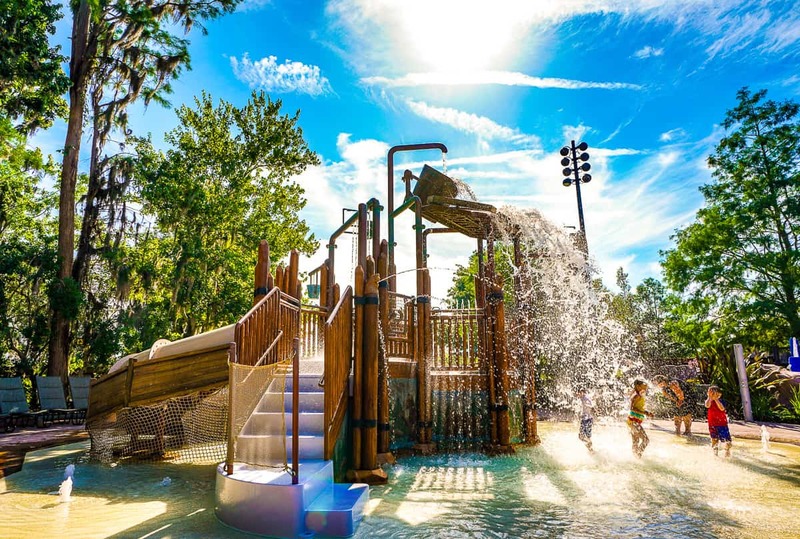 The main pool near Copper Creek Falls has a waterslide as well as an adjacent hot tub and a special fenced-in splash pad for younger children. A recreation staff member will coordinate poolside games in the afternoons for children between noon and 3 PM: bingo, charades, chalk art, and trivia games. The Boulder Ridge Cove Pool has no water slide but has a row of cabanas for guests, making it feel like the unofficial adult pool. The Geyser Point restaurant is very close by for food and drinks poolside and has a takeout window in addition to table service. Like every Disney resort, there is a game room onsite with the latest arcade games, a photo booth, and air hockey. Every afternoon next to the arcade, guests can learn to do tie-dye in the breezeway between the arcade and the Boulder Ridge Villas. At night, there are campfires and s’mores kits to purchase, though the marshmallows are complimentary. After the fires, families can watch the movies under the stars. 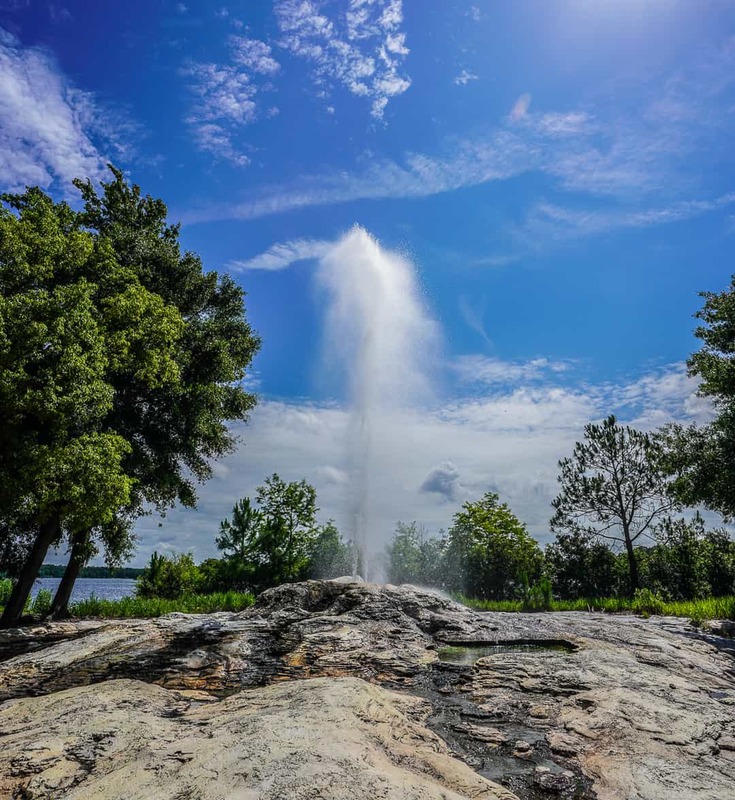 The Wilderness Lodge geyser goes off every hour. The Salon at Crystal Springs located near the Copper Creek pool just opened and offers nail, hair, and make up treatments. The Disney spa program is impressive, and all of my manicures and pedicures I’ve received from all of the resort spas have lasted longer than my services at home. Guests who are looking more for a bridal make up will be impressed to see that the spa uses Guerlain. Those interested in the new character make up transformation for adults uses the Mac makeup line for their more vibrant colors. All nail services are customized to an aromatherapy guests choose on their own from the Salt of the Earth line. After selecting your favorite scent, your nail technician will customize your manicure or pedicure by adding that fragrance to the scrubs and body butters. Selecting my custom aromatherapy from the Salt of the Earth spa line. I chose Bella Notte, named after the Italian waiter’s accordion love song from Lady and the Tramp, and I had a strange craving for spaghetti and meatballs afterwards. My nail technician explained the small building used to be the pool bar, and this mistake happens many times each day. The fitness center at the Wilderness Lodge is called Sturdy Branches, located adjacent to the Boulder Ridge pool area. Guests can also schedule massages at this fitness center. There is a complimentary yoga class near the Boulder Ridge pool deck at 7:30 AM. As of now, classes are Monday and Wednesday mornings. Guests reserve spots at the Teton Bike & Boat Rental hut. Guests can take complimentary yoga classes by the Boulder Ridge pool on select mornings. 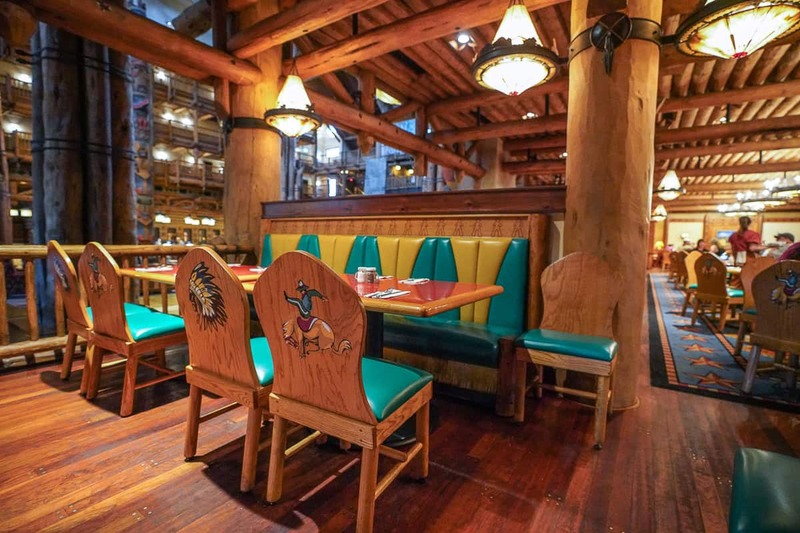 Whispering Canyon inside the Wilderness Lodge lobby is a utilitarian three-meals-per-day table service restaurant. They usually have availability for those who want to plan sit-down meals at the last minute at the one place where people book their meal reservations 6 months in advance. Whispering Canyon Cafe is just off of the Wilderness Lodge lobby. Whispering Canyon has a hybrid menu both of an all you can eat campfire-influenced menu as well as a la carte items. My red quinoa cakes were wonderful, and I was so grateful that Disney consistently serves healthy and vegetarian items. It was simply all I could manage to eat after having such a decadent and delicious lunch at Art Smith’s Homecoming in Disney Springs. Whispering Canyon used to have a more in-your-face approach to service. Cast members intentionally were sarcastic and a bit teasing. While I think that style has been toned down over the years, the ketchup trick remains for those eager enough to request it and play along. Servers invite young children to participate in a hobby horse race around the restaurant, and a few grownups typically get roped in on the fun, too. 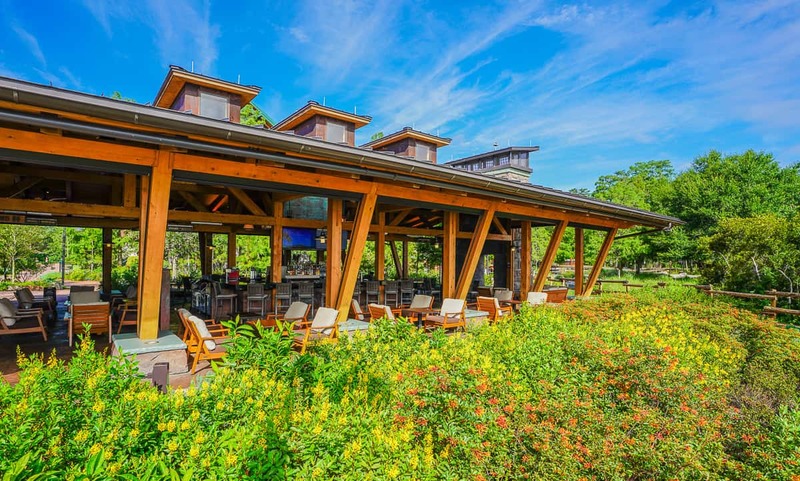 Geyser Point is the new restaurant at Wilderness Lodge in between its two swimming pools. It’s a restaurant with a roof but no walls, making its lake views lovely. Geyser Point is the newest restaurant at Disney’s Wilderness Lodge, serving breakfast, lunch, and dinner. The menu at Geyser Point is consistent with what I have seen, where the newer restaurants menus cater more to millennial food choices than the older restaurants. Our lunch focusing both on healthy and comfort food hit all the right bases. Artist Point is the signature restaurant open only for dinner at Disney’s Wilderness Lodge. Sadly, I have not yet eaten at this restaurant, but it’s always been a foodie favorite at Disney World with reservation availability better than others. Artist Point is the signature restaurant at Wilderness Lodge, open only for dinner. I will be dining here soon, and will update the article. Territory Lounge is the adjacent lounge and bar to Artist Point that opens late afternoon. The Roaring Fork is the fast service restaurant open all day that offers sandwiches and salads and a small menu. Their campfire cupcake is a must to celebrate the Lodge. Another new feature at the Wilderness Lodge is Reunion Station. This lounge is exclusively reserved for Disney Vacation Club members and their guests. Reunion Station is an exclusive lounge for DVC members. 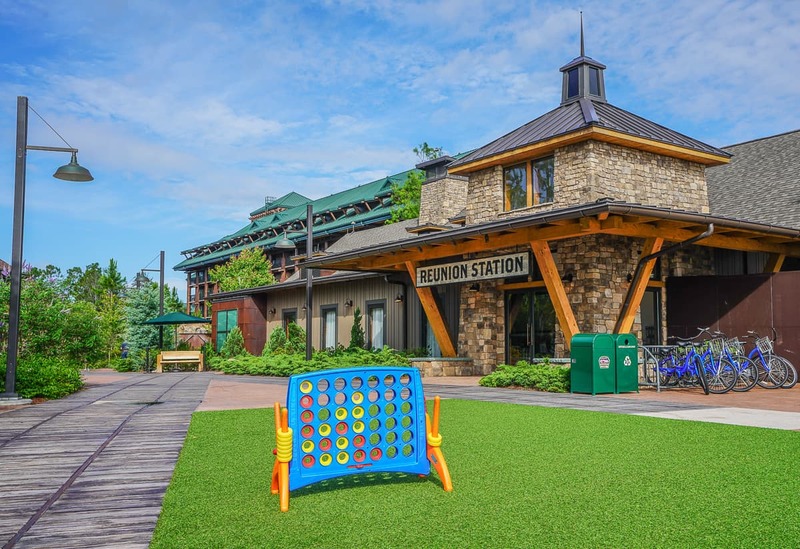 While Disney Vacation Club members stay at either the Boulder Ridge Villas or the Copper Creek Villas, they are eligible to purchase club room access inside Reunion Station for a daily fee that will offer continental breakfast, afternoon snacks, and cocktails in the evening. If you’re a Disney Vacation Club member but not staying on property, you and your guests can register for some fabulous afternoon classes. Current programs include photography, painting, and cocktail making. Similar to Disney Cruise Line’s most popular mixology classes that always sell out, these classes are themed around making two different cocktail recipes while enjoying accompanying food items that complement the drinks. Both drinks were inspired by the resort’s celebration of the Pacific Northwest: a Cascadian Fog and Lemonade on the Rails. The Cascadian Fog used scotch, tequila, agave, Peychuad and Angostura bitters. We lined the glass rim with the oil from orange peel, poured our mixture over an ice sphere instead of a cube to reduce melting, and we smoked our cocktails and garnished them with a sprig of rosemary. Mine was a rich golden color compared to everyone else’s because I misunderstood the instructions using droplets of bitters. Generous plates of charcuterie and crudité on the tables gave us something to munch on after the hard work of poring pre-measured liquor into a shaker. 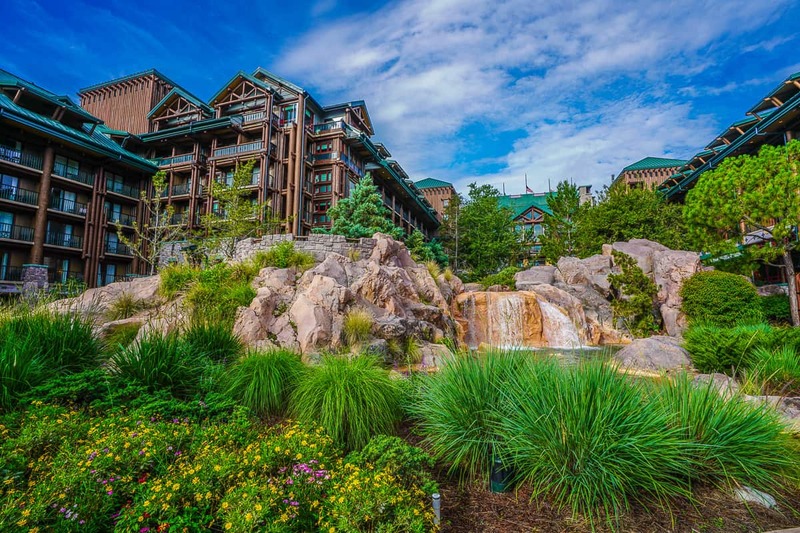 The Wilderness Lodge has traditional resort rooms and a club level in addition to two Disney Vacation Club sections. There are traditional resort rooms in the main building, though many have now been converted into DVC villas. A standard room comes with either two queen beds or a queen bed with bunk beds. The courtyard view is the premium view, while the standard view will show resort grounds. There is a club level with access to the Old Faithful Concierge Lounge. The food displays come from the signature restaurant, Artist Point, and has a reputation for being very delicious. Club level guests can enjoy breakfast, afternoon snacks, evening appetizers, and desserts each day. What are Disney Vacation Club Villas? 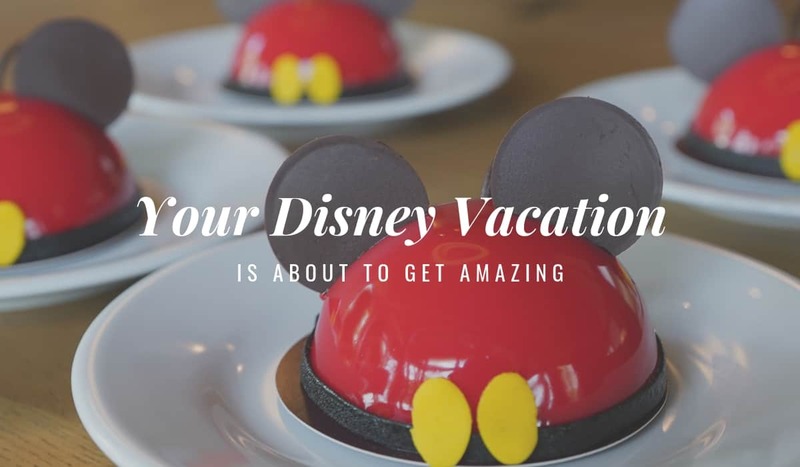 Luckily for us, you don’t have to be a Disney Vacation Club member to book Disney Vacation Club properties. Disney Vacation Club units are villas located inside all of Disney’s deluxe properties. There are certain resorts Disney Vacation Club offers like Old Key West and Saratoga Springs where all rooms are part of DVC. The Disney Vacation Club (DVC) villas at Wilderness Lodge are split into two different sections. The Boulder Ridge Villas were recently updated from the original DVC villas and given a new name. 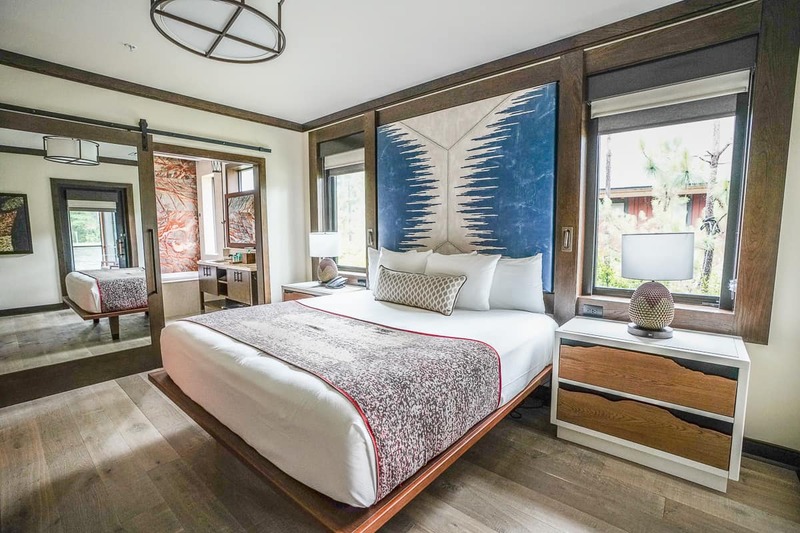 The Copper Creek Villas are the newest villas at the Walt Disney World Resort (until the new Riviera Resort property opens in 2019), showcasing the most recent design. They are stunning. 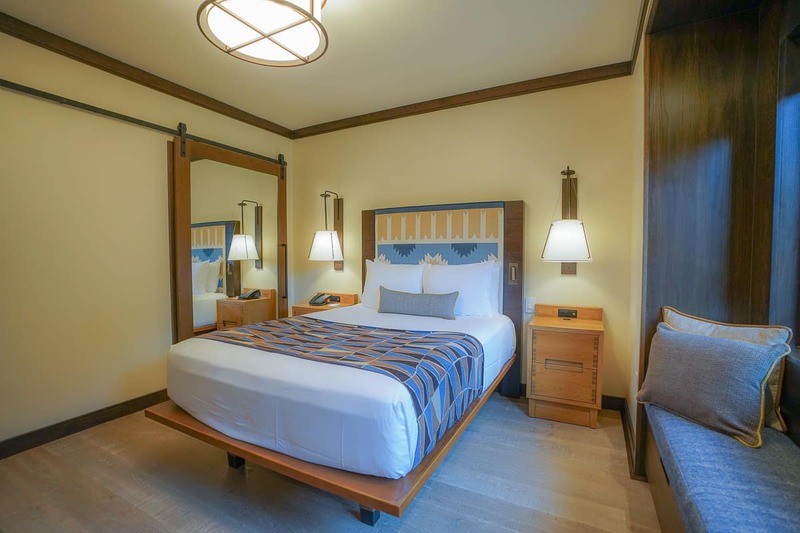 Almost all Disney Vacation Club properties start at a deluxe villa that offers a queen bed and queen size sleeper sofa. Every DVC property offers a one or 2 bedroom villa floor plan for those seeking full kitchens, washers, and dryers. Some DVC properties like the Copper Creek Villas offer a 3-bedroom Grand Villa. But the cabins are the hot ticket everyone is talking about. And now let’s talk about those Cabins! 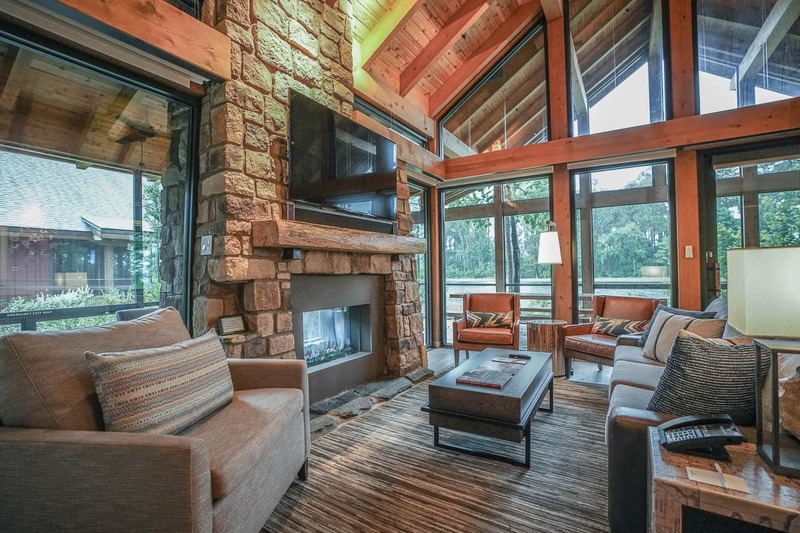 The cabins are the premier option at Copper Creek with their privacy and standalone seclusion. 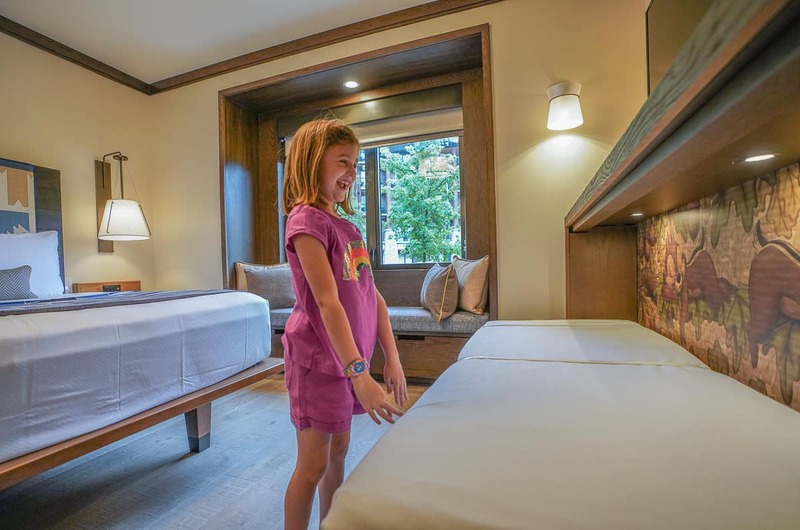 The most memorable aspects of the cabins at Copper Creek are those things that make it unlike any other property at Disney World. One walks down a hallway to the two-story wall of windows overlooking the lake. The fenced in hot tub on the porch gives off a blue light at night. The sounds of the fireworks and the Electrical Water Pageant travel across the lake and tell you that you have found a new way to experience Disney’s magic. An L-shaped screened-in porch envelops the living room and dining room. A two-sided gas fireplace provides coziness inside and out on the porch. This fireplace alternates rainbow hues in its flames. My daughter instantly claimed these porch rocking chairs as her reading nook. The hot tub in the far corner it’s fenced off for protection should you be traveling with younger children. It’s completely decadent and perfect. No matter the weather outside with Orlando’s ever-changing forecast, we had a special place to put on our suits and celebrate being together despite any rain or any cold-weather headed. I could see the fireworks blasting just over my line of trees. Other cabins might have a more unobstructed view since our cabin faced a tiny island. Their rainbow lights created mirror reflections in the lake. There are two bedrooms in the cabins. The sofa and armchair in the living room convert to twin and queen beds, making the cabins sleep eight comfortably. The Copper Creek Cabins Master Bedroom. The master bedroom has a king size bed and an en suite bathroom. A door in the master opens out to the screened in porch near the fireplace and rocking chairs. 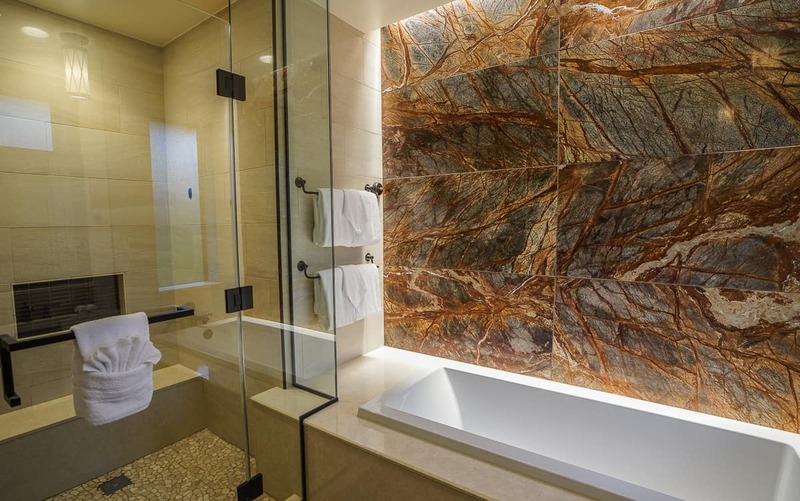 A large wood and mirrored door slides on tracks to the master bath to reveal a spectacular marble tub with copper shower fittings and a separate two-person shower with bench inside. These master bathrooms are Disney‘s finest, or at least the finest I’ve seen. The master bath, with its bronze fittings, jetted bath tub, and double seat shower, is completely 5-star. The second bedroom has a queen and a pull-down Murphy bed to reveal a Chip and Dale decorated inside. The second bedroom offers a queen bed and a twin Chip and Dale Murphy bed. Guests sleeping in the living room and in the second bedroom use a split bathroom. Located in the hall next to the washer and dryer closet, one has a toilet and sink. The other has a sink, vanity, shower, and hidden Mickey. Seeing Chip and Dale for the first time. All bedroom windows contain two layers of blackout shades. I was impressed that one layer of shades fits inside tracks so no light escapes from its side. The second layer adds extra opacity. We don’t want to spoil the hidden Mickey. We have an early riser child who slept later than she almost ever has because of the well-darkened rooms. It would be a challenge for a family to use up all storage options. Several drawers, under the bed and bench storage, and a large utility closet provide room for everything. The storage closet contained a laundry basket, high chair, vacuum, and pack n’play. The kitchen and dining room are fully stocked for eight guests. The large square dining table also seats 8 as does the picnic table on the porch. The kitchen cabinets were filled with items for cooking. This is Disney World, so there are no Nespresso machines, just a Mr. Coffee drip with Joffrey’s packets, so pack more beans and a decent chef’s knife (in your checked luggage!) if you plan to do any serious cooking. There are two sections of cabins on the far east or west stretches of lakefront property. Our cabin was in the western section, steps from the boat to Magic Kingdom, near the lobby, and close to the pool area. Guests who decide on the other section that is more remote will enjoy less noise, (the boats passed our cabin and honked as they approached the docks) but they will have more wildlife, too. Our fauna was cute little rabbits. We found the cabins exceptional. Given the Wilderness Lodge’s popularity over the holidays, I think the cabins would be the ultimate choice for the holidays. Everyone could take a warming dip in the hot tub after attending the Very Mickey Christmas Party. Large families can put extra people in the Copper Creek Villa studios. But the whole group can enjoy the cabin kitchen and living room area to gather. There’s a way to save as much as 50% off of a stay if you book a cabin. 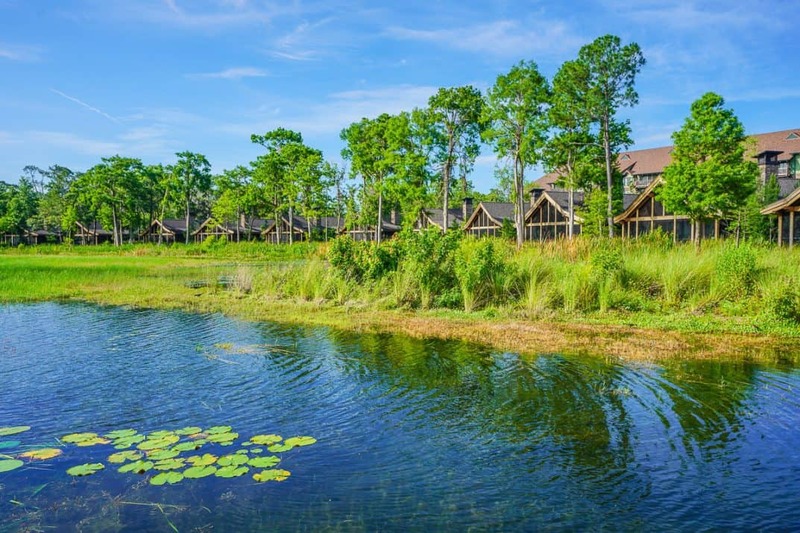 The villas and cabins at the Wilderness Resort are part of the Disney Vacation Club, Disney’s version of timeshare units, but it’s still available for the public to reserve. Those in the know reserve DVC units by renting points from DVC owners directly or through a service. We have use David’s Vacation Club Rentals to save more than 50% off of the rates we would have paid by reserving direct with Disney. 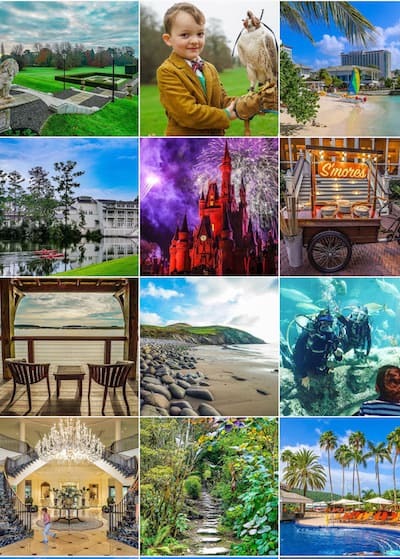 Our experience with David’s Vacation Club Rentals was seamless, and at this lower price point, I enthusiastically recommend the villas while staying at the Disney World Resort. 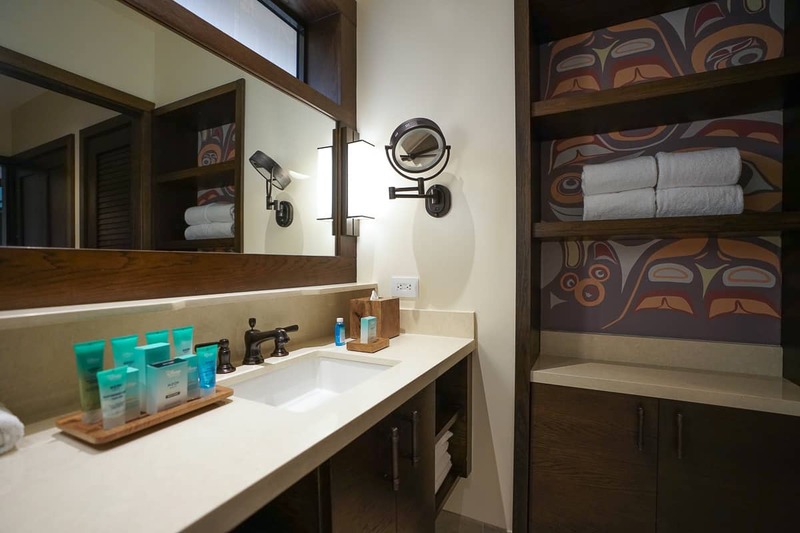 Given that the Disney Vacation Club rooms at the resorts are almost always newer and nicer than the hotel rooms, this is the best way to stay deluxe at Disney World while saving money. David’s works as an intermediary between you and the DVC owner who is selling you points. The owner doesn’t get paid in full until your check in date, so David’s Vacation Club Rentals works like an escrow account to protect you. Once booked, you can still add Magical Express reservations or Disney dining plans, and they can walk you through that process. You can see how much you will save by using David’s point calculator on your stay dates and then compare that cost with booking the villa units directly. You must pay a refundable deposit for them to query owners for your stay, and they look at first, second, and third choices you list. When they have been unable to book me something, they refunded my deposit instantly. If that happens, you can call to speak to an agent directly who can tell you what is available around your original query if you want to keep trying. I have always gotten my deposit refunded immediately, and the agents have typically found alternate options for my dates if my first choices weren’t available. The only drawback by using David’s service is that you will not receive daily housekeeping without a fee, and you must commit to your travel dates. Let me plan your Disney World vacation. 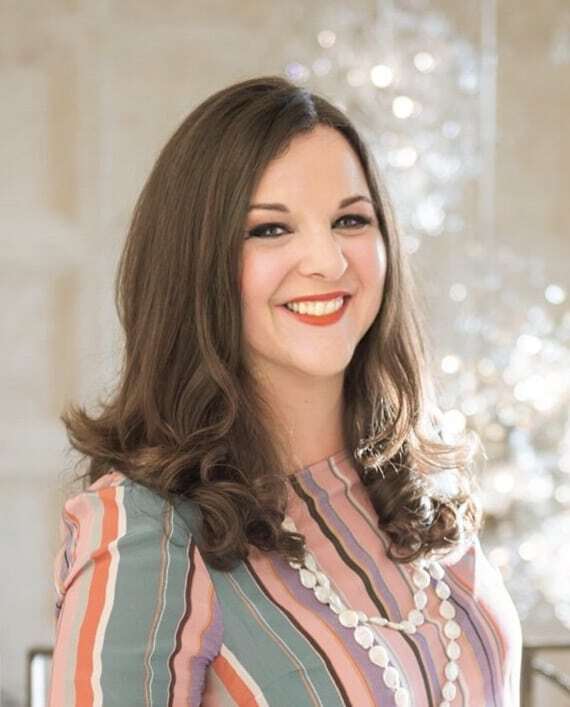 I’ll help you choose where to stay, your theme park and ride schedule, and steer you to the right restaurants for your family. I’ll share what VIP experiences are worth every penny and show you what to skip. 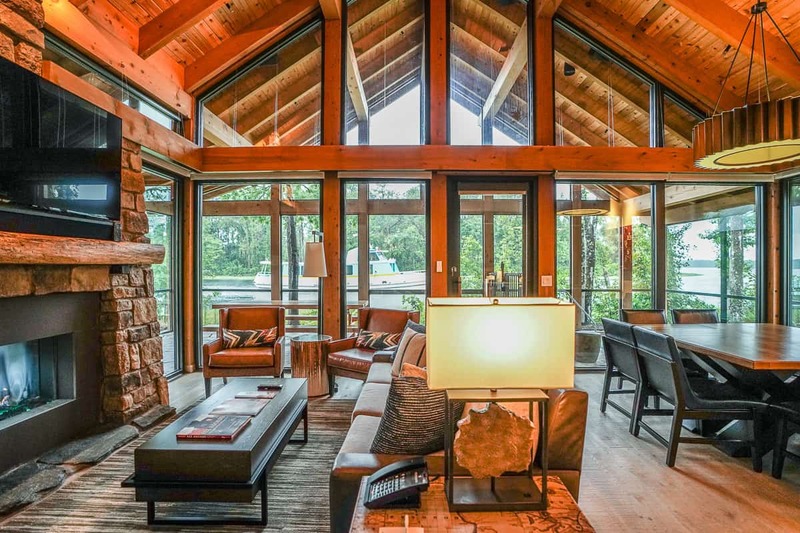 Enjoy our video walkthrough of the Copper Creek cabins now. Although we were guests of the Disney Vacation Club, these opinions are entirely my own. Um, yeah. I want to move into one of these cabins and live there forever!